The records of the medieval English courts were compiled into manuscript 'year books', organised by regnal year of the monarch. 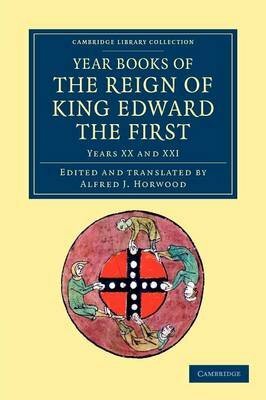 The year books for the regnal years 20-2 and 30-5 of Edward I (1239-1307) were edited for the Rolls Series by Alfred Horwood (1821-81), and published in five volumes between 1863 and 1879, with translations provided for the Anglo-Norman text. Horwood notes that the quantity of cases is surprising given the size of the population. He attributes this to confidence among the people in the king's justice, but also points out that the law's delays during this period were notorious, and that in 1289 the king had effectively purged most of his judges on the grounds of corruption. This volume, published in 1866, contains reports of cases in the jurisdictions of Herefordshire, Shropshire, Staffordshire and the Common Bench in 1292 and 1293.